Fully refurbished HP Laserjet IIISi, please also check below for the accessories we offer for the model IIISi. If you have any questions feel free to Email, FAX or Call us. We also offer REPAIR service on this model of printer, if you wish to have your printer Repaired please Go Here. There are also a number of options from which you can choose to customize the IIISi to fit your specific printing needs, such as a duplexer for double-sided printing, HP JetDirect cards for fast networking, Adobe PostScript, and Job offset feature to separate multiple print jobs in the paper output bin. Recommended for printing any text documents, small to large spread sheets, small to large forms, small graphics up too full page, small to large networks. Series IIISi was designed for larger office and network printing. When attached to a network this printer can handle multiple print jobs being sent to it at the same time. With the job offset feature added each print job will be offset and separated in the output bin. 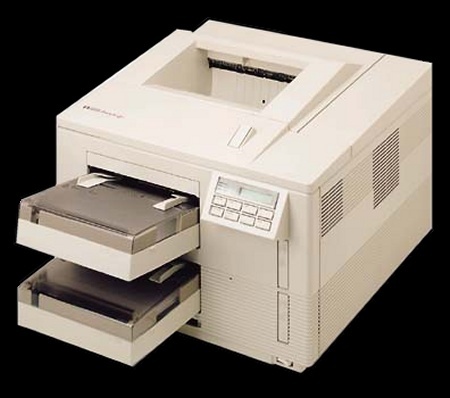 The laserjet IIISi is a large printer about twice the size of a model III and weighting in around 110 lbs. This printer is made to take the abuse of fulltime printing, many of these printers are still in offices today with page counts in the millions. *NOTE: The Model IIISi Laserjet does not have Parallel or Serial ports built into it. A interface card will need to be added in order to print from a computer or network.